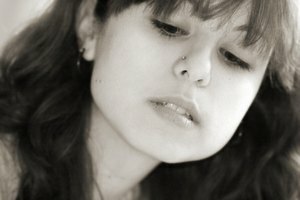 Whether you've outgrown your nose pierce, or simply feel the need for a change, the removal process is pretty straightforward. Expect the hole to leave its mark, though - a legacy to the period you're leaving behind. Sterilize a pair of tweezers in boiling water for about 10 minutes. Let them dry in a fresh gauze wrap. Begin with clean dry hands and a face that's free of makeup, lotions or any treatment products. Make sure that your bathroom has plenty of light and that you have enough room to move your elbows freely around your face. Take the tweezers in your strong hand and delicately place the tips on the outside edges of your nose stud. Press your nostril gently against your nose as you pull the stud out in a slow, steady stroke. Remove a barbell at the bridge of your nose by stabilizing the stationary ball with your fingertips and then unscrewing the removable ball. Depending on the placement you may be moving your fingertips in the direction of your eye - take care not to poke yourself. Tilt your head back slightly, then take either end of a horseshoe ring into your fingertips. Gently pull the ball to release the end of the bar, then slide the bar through the hole and off of your nose. Getting the right angle can be tricky. 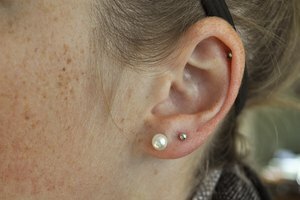 If you realize self-removal may not be an option, enlist the help of a friend with a gentle touch and non-squeamish nature, or make an appointment with your original piercer for removal.